Diana Challoux, Come On Down! Home Articles Physique & Bodybuilding Diana Challoux, Come On Down! When she was 20 years old, she decided, on a whim, to spend one day in LA with some Sorority sisters. Their plan was to get tickets to The Price Is Right game show. Before she left, she jokingly told her friends and family that she was going to "meet Bob Barker and win a car!" So they sat in line all day and never made it in to the show. Apparently everyone gets tickets, but only the first 300 people in line actually get in to the show. They were so disappointed, they all decided to stay another night, cram seven girls into one cheap (we're talking college students) motel room, and get in line the next morning at 5AM. Well, they eventually got into the show. The next step was an interview process with the producer who actually spent about 30 seconds speaking with each audience member, individually, to determine who would be called to "Come on down..." Apparently telling the producer that she was going to "give Barker's Beauties a run for their money" was all the producer needed to hear. Diana got called down to play the game where you have to pick two products that are the same price. She did it and she won...... A CAR!!!! That's Diana Challoux. Read on to hear more about this self-proclaimed "goofball." RX: When did you first consider competing in figure competitions? DC: After college I moved to Utah with some friends and became a ski bum. That's when I got my Personal Training certification and first started thinking about competing. RX: What was your first competition? RX: Wow. Two wins in your first two competitions! That's definitely encouraging. But to go un-noticed on the National Stage has to hurt a little. Especially after momentum like that? DC: Needless to say, I was a little confused. That's when I decided to give the FAME Northeast Classic a try. I won 1st place Overall Fitness Model and my WNSO Pro Card! RX: You've had a lot of promising career opportunities since the switch, haven't you? DC: Yeah. I went on to win the title of FAME Fitness World Champion, WBFF Pro, and WBFF Figure World Champion! Some of my prizes included a photo shoot with Oxygen Magazine and Muscle & Fitness, appearances with Grizzly Fitness and a supplement contract with MusclePharm. RX: Have you worked any booths at some of the big shows? DC: Yeah. As a matter of fact, I have a funny story about this past Arnold Classic. I was working the Grizzly Fitness Booth and Arnold was walking past us. 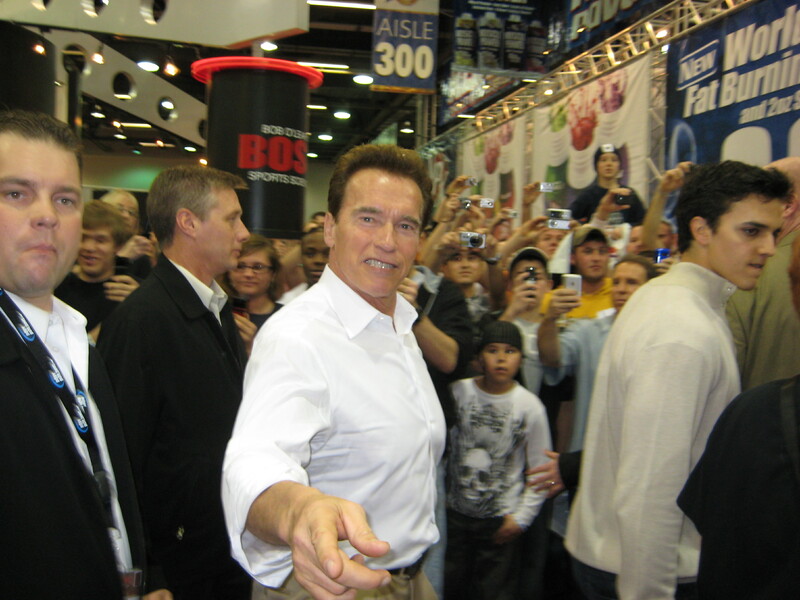 As I was holding up my camera to take his picture, Arnold stopped and pointed toward someone and said ‘Nice abs.' So I took the picture at the very moment he was pointing and when I put my camera down and looked at him, he said it again: ‘nice abs' and I realized at that very second that he was talking to ME! I think I just got the ultimate compliment anyone could ever get! Arnold told ME I had nice abs!!! RX: And the picture of him saying it to prove it! RX: You recently moved from San Antonio to Kansas City, right? DC: Yes. That's a funny story, too. It's the first time in my life that I moved anywhere for a boy. RX: But weren't you pretty involved in the community in San Antonio? You were known as a local celebrity, weren't you? DC: Yes. I even had regular appearances on the local news station as the "Fitness Tips" girl. It was crazy...people recognized me on the street! There was no professional reason to move. RX: So how did you met this man who tempted you to move and start over? DC: Believe it or not, we met on MySpace! I get emails all the time from people and I try to be nice to everyone - even the crazy people. Obviously I delete the rude comments that are inevitable, but I kept getting really nice emails from this one guy, Micah. We wrote back and forth for a while getting to know each other. It turns out that my friend wrote an article for Muscle & Fitness and Micah was the fitness model they used for the article. So I asked my friend about him and he said that Micah was a good person. I had never met him in person, but we decided through our MySpace correspondences that we may cross paths at the Olympia. Nothing was set in stone, but as it turned out, we did meet up and from that moment on we were basically glued to each others' side. We developed an undeniable connection and made a few trips to see each other. We both have an amazing passion for fitness and helping people and the more we got to know each other, the more apparent it became - I decided to pick up and move from San Antonio to Kansas City. RX: That's a pretty bold move. So how are things going in Kansas City? DC: Well, just recently the Hallmark Greeting card company contacted me. Their headquarters is in Kansas City, and asked me to do a photo shoot for a greeting card! It's supposed to be a comical card. They did my hair and makeup all up and have me dressed up looking like I'm doing housework. I haven't seen the card yet, so if anyone sees it, I'd love to hear about it. I have no idea what it says or what it looks like! RX: Not too many people can say they are on a greeting card. What other projects are in the works? DC: Currently, I have teamed up with Micah LaCerte and we published a book called HitchFit. Together we offer an online program complete with nutrition, training and life coaching. I also work one on one with clients at a local Personal Training Studio in Kansas City as well as online. I can be reached at [email protected] for consultations. RX: You have to share with us what you "off" season diet looks like. DC: I really don't have an "off season." It's not like I go through as bulking phase or anything. I've pretty much got my body where I want it and now it's just a matter of maintaining it and fine tuning it. I try not to fluctuate more than 8-10 lbs. from my competition weight. I have one cheat meal a week that always includes this chocolate cake layered with peanut butter ice cream! It's the best cake and ice cream anyone will ever have and it's both peanut butter and chocolate!! Who could ask for more!?!? Then it's back to my routine. If I ever get "off track" it's with using a FF dairy item or something like that. For the most part, though, I eat clean. RX: Thanks for sharing such great stories with us. We look forward to seeing you in Oxygen and we'll be on the lookout for the hottie on the front of a Hallmark Greeting Card! DC: Thanks! Send it to me if you find it! Hahahaha.